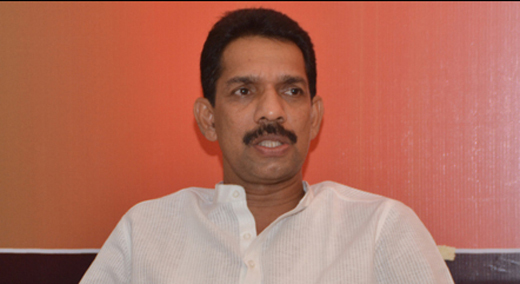 Mangaluru, Sep 8, 2017: The City police registered an FIR against a Dakshina Kannada MP Nalin Kumar Kateel for threatening policemen and stopping them from arresting BJP workers. A complaint was registered against BJP MP for stopping policemen from doing their work during the party’s ’Mangaluru Chalo’ bike rally on Thursday. On Thursday, a video of the BJP MP threatening policemen for arresting BJP supporters, who had gathered for the rally despite a ban, went viral. The MP threatened to "shut down Mangaluru if BJP leaders were not released" in the Kadri police station. A complaint was registered by the staff of the police station that accused Kateel of stopping a public servant from discharging their duty. BJP leaders and workers courted arrested on Thursday after they defied police order banning processions in the city. Kateel’s intimidation was caught on camera. The Mangaluru city police on Friday have booked a case against Nalin Kumar Kateel, Member of Parliament, Dakshina Kannada, and others for allegedly “obstructing the work” of Mangaluru East Police Inspector Maruti Nayak after the BJP protest at Ambedkar Circle on Thursday. According to Police Commissioner T.R. Suresh, the police have taken up a suo motu case. Mr. Suresh told reporters on Friday that the police had detained BJP workers who had taken part in the ‘Mangaluru Chalo’ protest at a hall near Kadri Park. It took some time for the police to complete the formalities of detaining and releasing 50 workers. Mr. Kateel arrived at the hall when the formalities of 12 workers were yet to be completed, and obstructed the work of the inspector. The Commissioner said another case has been booked against the BJP Yuva Morcha in the Mangaluru North Police station for holding a protest meeting at the Ambedkar Circle in violation of orders prohibiting rallies and protests imposed under Section 3 of Karnataka Police Act till midnight of September 8. A third case has been registered against the BJP in the Mangaluru South police station for its workers throwing stones at a KSRTC bus and attempting to deflate the tyre of another KSRTC bus near Hampankatta during the protest meeting. Mr. Kateel had maintained on Thursday that the police had detained party workers, including women, at Kadri hall for three hours without providing food and had taken the inspector to task when he told him that he needed orders from the Police Commissioner to release a few workers even after completing the formalities. Never misuse the powers , MP Nalin Kumar was harsh on the Inspector who was on duty . MP Nalin Kumar should be suspended for abusing Police Inspector Maruthi Nayak Chalo Bike rally which was to be held on September 7, by BJP Yuva Morcha in Mangalore was denied. 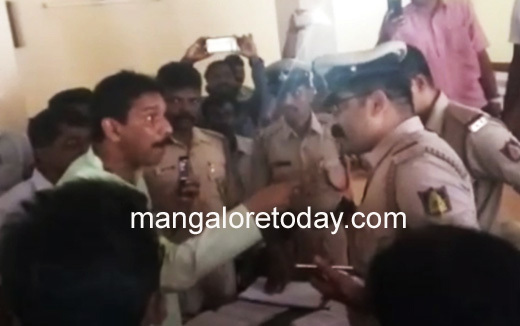 MP Nalin Kumar was seen at Kadri Police Station abusing Police Inspector Maruthi Nayak; In the video you will see MP Nalin Kumar using foul language, he even snatched Inspectors phone and threatened to call for a Bandh in the name of Inspector.